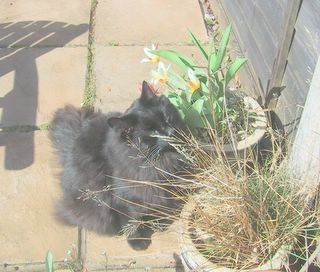 Two Black Cats: Arty Being Adorable! Mom said she'd plant cat grass - I wonder if this is it? and The Carnival of the Cats on Sunday. 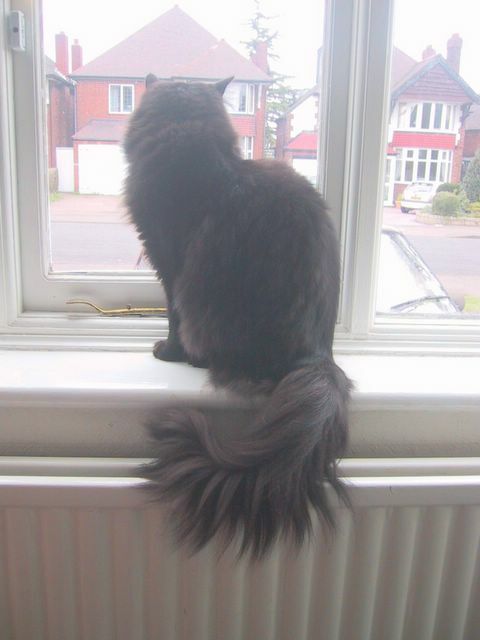 That is a magnificent tail. Wow! It is such a purrty tail! You could win in a purtiest tail contest we bet. That is a great tail Arty. We are really enjoying the pictures of all your plants too. My mum has promised to get on with planting stuff this weekend as it is Bank Holiday so she can't say she doesn't have time to do it! Indeed, a gorgeous tail! That plant you're sniffin' looks a little on the prickly side however. Indeed it is a magnifient tail you have! It is like a plumb!